Jersey Jim brings his award winning FunTastic Family School Fundraising program to Marquez Elementary school in Pacific Palisades. 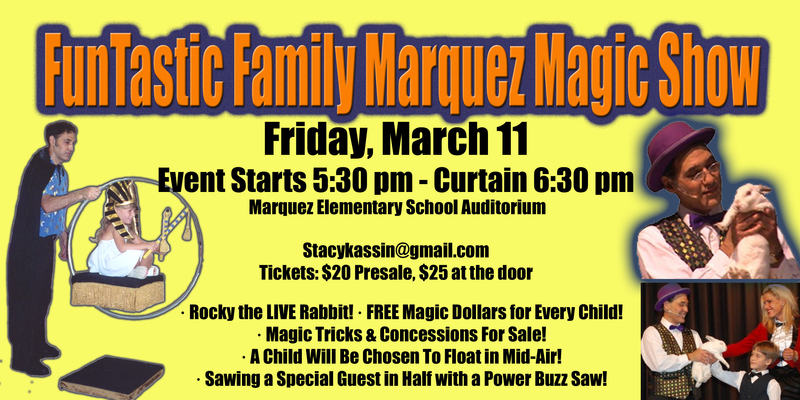 In an effort to boost fundraising efforts, Marquez Elementary School has enlisted Professional Magician Jersey Jim to present his amazing FunTastic Family Magic Show on Friday, March 11, 2016 at 6:30 PM. What can attendees expect? The FunTastic Family magic show is the same show that Jersey Jim performs at professional theaters. It features 90 minutes of unique entertainment complete with music, beautiful props, and Jim’s hilarious blend of comedy, audience participation, and grand illusion, including sawing the principal in half with a power buzz saw! Jim is quick to reassure that all ages will be laughing at this comedy routine. Another amazing moment includes causing an audience member to float in the air! Jim will be selecting a child from the audience and will even pass a hoop around them to prove they are floating! Jersey Jim appeared in the film, “Couples Retreat.” “It was an honor being picked by Vince Vaughn from all the other magicians in Los Angeles,” Jim said. Every child who attends will also receive a free magic gift and be able to pet the magician’s appearing rabbit after the show. Tickets for the event are $20. Tickets will be available the evening of the event as space allows. This entry was posted in School Fundraising Magic Show on November 10, 2015 by Jim.